Great romantic getaway to Paradise! Lovely, beach front Studio Condo #707 at Valley Isle Resort....with awesome views of fabulous sunsets, neighboring islands Molokai and Lanai, and whale watching in season. Within walking distance to shopping, restaurants. Enjoy the tropical breezes provided by the West Maui Trade winds. Sleep and wake to the sound of the gentle waves in this cheery, tastefully decorated condo with a very comfortable queen sized Murphy Bed which allows for a lot of living space and a wardrobe closet. Bright, modern, full sized, well equipped kitchen for you to whip up a Mai Tai or a delicious meal. Full sized bathroom with tub, shower, and ample storage cabinets. In-room safe, beach chairs and other miscellaneous beach items, Free Wi-Fi Access and many other amenities. Nice laundry room on the 3rd floor next to the elevators. Free Parking Pass. Everything you need for a fabulous stay on Maui! Richard and Barbara French are retired business people, parents and grandparents. We have enjoyed the peace and beauty of Magical Maui for many years, and are happy to share our "little pice of paradise" with others. We love knowing that so many kind people enjoy their stays there. This location is perfect...central to lovely West Maui and all our favorite beaches, activities and places to visit. It is right on an uncrowded sandy swimming beach with awesome views and sunsets, and within walking distance to shops and restaurants. Cooled by wonderful West Maui Tradewinds. The privacy, the quiet, and the relaxing sounds of the ocean. The fantastic views of the ocean and neighboring islands and breathtaking sunsets to be enjoyed from the comfortable, private lanai....which also provides front row seats to whale watching in season, sea turtles at times and many other forms of marine life. Uncrowded sandy beach for swimming, sunbathing, walking. 1 set of 4 Beach Towels can be supplied for a $12 charge upon request. Shared-nice laundry room located on 3rd floor next to elevators. Assortment of beautiful Hawaiian music. We really enjoyed our time. 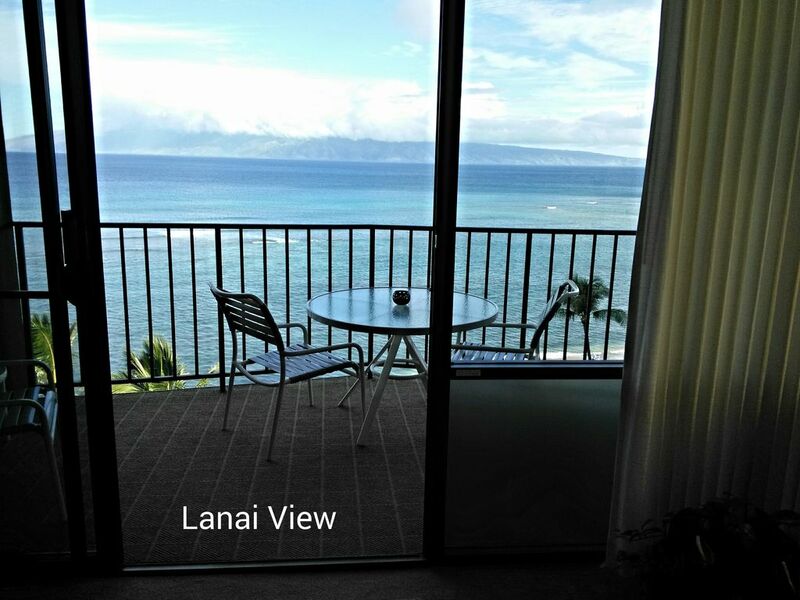 Perfect Beach view from Lanai. We watched whales while having coffee from Lanai! Easy access to a beach and everything this Resort has to offer. We will come back again!!! The place is small, but cozy, with a neat view. Several eating options in walking distance: Miso Phat, Dollie’s, Maui Brewing Co, McDonalds. Come during whale season and see some whales! Unfortunately we didn’t anticipate how humid it would get in August and were regretful about it getting a place without AC, which is our fault. Thank goodness they supplied a couple fans, but if you are sensitive to heat as I am please think twice as there were several times when I had to go to the pool to cool down. We are so happy we chose to stay in condo 707 at the Valley Isle Resort. The condo was extremely clean and well kept and had everything we needed during our vacation. The view was so spectacular that we spent almost every morning and night out on the lanai enjoying the picture perfect scenery. The beach is literally footsteps away and it never got that crowded which was great! We were always able to find 2 open chairs next to eachother and at times, the beach felt like our own private place. Richard and Barbara were so helpful and responsive to all our questions. We would definitely recommend staying here while in Maui and will stay here again on our next visit! Maui. It is steps from the ocean with breathtaking views and ocean sounds 24/7. We have enjoyed two fabulous stays in the studio unit #707. The second visit was just as great as the first. We watched whales from the lanai and enjoyed the sound of crashing waves as we slept. The unit is very comfortable and has everything you need for a wonderful stay. We intend to be back here in 2009 or 2010 for about 3 weeks. Can't wait to come back! Rates include cleaning fees for stays of at least 7 nights. No extra cleaning fees for stays of at least 7 nights. Prices subject to change.